A throwing knife turns in flight like a cartwheel. It takes lengthy training to get it reach the target tip first. The Gyro Dart eliminates this challenge: in flight, its tip always faces the wooden target, into which it sinks with a satisfying thunk. The concept to throw a knife like a spear has been conceived (and patented) by the Spanish engineer Paco Tovar in 2002. Over the years the basic idea remained the same, but construction and handling have been refined continuously. The result is a throwing knife that's pure fun: The Gyro Pocket reliably sticks in the target after only few training throws, regardless of previous knife throwing experience. 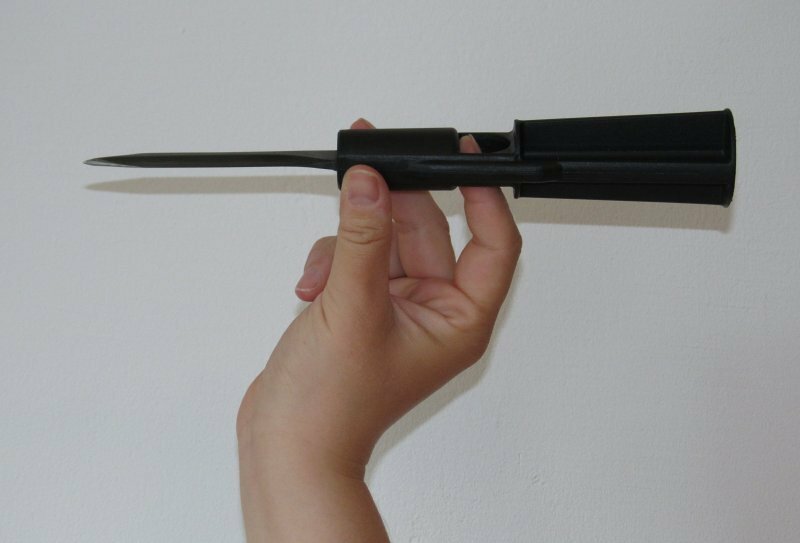 The throwing knife is suitable for distances up to 9m. For a start, go stand on a big lawn, hold the knife in a loose grip (detailed below), and throw it with a loose wrist. After the first few tries, the knife won't turn like cartwheel any more, but will fly straight! Now get a wooden target (minimum 70cm squared, you don't want to concentrate on the aim yet), stand in a distance of 5m, and Go at it! The Gyro Dart is a throwing knife you can just take out into the garden and see what you can turn into a target. And from which special positions you're still able to stick it! The throwing knife is shipped in a sturdy leather sheath with belt loop - meaning the Gyro Dart can be handy for camping, too. You can buy this knife in our online shop. Index finger, middle finger and thumb grab the knife head with their tips, like they would grab a walnut (see picture). The index finger rests behind the head, and will later propel the knife forward. Thumb and middle finger loosely grab the sides of the head. Once you got the move down, it has a very natural flow, and you don't need to concentrate on it any more. The throwing knife has a length of 25.5cm. The handle (max. diameter 4cm) is made from Zytel 801 and very robust. Made from carbon steel (AISI 1045), the blade is 10cm long and 4mm thick, the tip is very sturdy (obtuse angle). The blade is blunt enough not to cut your skin, but primed for sharpening. Flying Knife 2002 32cm (16.5cm) 215g 5-20m For long distances (US record 18.10m!). Requires serious training until it flies straight for long. Gyro Pocket 2012 24cm (9cm) 160g up to 7m Foldable, in-your-pocket item. Easy to learn. Lightweight construction allows only for a few failed crash throws before loosing form. Gyro Dart 2013 25.5cm (10cm) 170g 3-9m Futuristic design, compact and robust. Very easy to learn. Why are the Gyro Dart and the Gyro Pocket easier to master than the Flying Knife? That's mainly due to them being shorter, which means that in flight, the oscillating movement dies down quicker. The lower weight and the smaller diameter of the launching head help. The name owes to Paco Tovar's idea that the knife turns around its longitudinal axis, like a spear, thus stabilising the flight due to the gyroscopic effect. The Gyro Dart sticks every time! Can I now just switch to ordinary throwing knives? That won't work. The Gyro Dart flies like a spear. Normal throwing knives turn like a cartwheel in flight, and require another throwing technique. But who needs ordinary throwing knives any more? If you want to go for longer distances, do have a look at the FlyingKnife that also employs the spear throwing style.